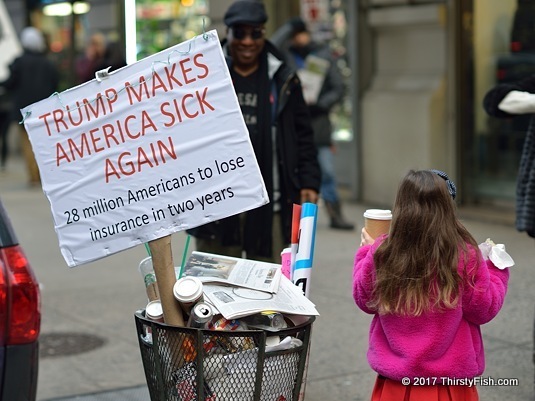 Trump Makes America Sick Again? In the United States, somewhere between 20,000 to 40,000 die each year because of lack of health insurance. I have friends from all over the world. When I tell them about the state of healthcare in the U.S. and the anxiety it causes among Americans, they don't believe me. If you exclude Medicare for older (65+) citizens and Medicaid for very low income families (and maybe a few others), health insurance in the U.S. is "provided" by for-profit corporations. The first disturbing fact is that many people do not have or can not afford insurance at all; In 2012 over 48 million people had no health insurance (out of a population of about 315 million). With the introduction of ObamaCare (ACA) in 2014, this dropped to 28.5 million in 2016. But those numbers are deceptive. For-profit private healthcare system is taking its toll on Americans; Under the implementation of "insurance plans", coverage is often irrationally restricted and "out-of-pocket" costs can add up to thousands of dollars; People "with" insurance regularly bankrupt or near-bankrupt themselves. ObamaCare promised to increase coverage and reduce the uninsured but rates have risen drastically. A typical individual health plan costs about $700-$900 a month and a family plan upwards of $1,300. President Obama had the opportunity to introduce a single payer healthcare system but sided with the healthcare industry which contributed big to his election campaigns. Now we have President Trump and Republicans promising to "repeal and replace" ObamaCare. But so long as the "for-profit" factor stays costs will increase and coverage will diminish. Given that only a handful of insurance companies remain due to mergers, we already have a de-facto monopoly in place. The "business friendly party" is not going to challenge that. Although the rhetoric changes between the Democrats and the Republicans, when it comes to supporting the interests of large corporations there's hardly any difference between them. Thousands of uninsured and underinsured will continue to die and hundreds of thousands will bankrupt themselves. Here is a good article about rising cost of living with a section on healtcare costs.